Water managers need more skillful information on weather and climate conditions with lead-times ranging from 15 days to 45 days and beyond. Lacking skillful sub-seasonal information limits water managers’ ability prepare for shifts in hydrologic regimes, such as the onset of drought or occurrence of wet weather extremes. The challenge of sub-seasonal forecasting is that it encompasses the time frame where initial state information (e.g., coupled land-atmosphere processes) becomes less important and slowly varying long term states (e.g., sea surface temperatures, soil moisture, snow pack) become more important to prediction skill. In response, Reclamation is launching a forecasting prize competition where solvers will submit forecasts of temperature and precipitation for one year, competing in real-time against other teams as well as official forecasts from NOAA. Recognizing NOAA’s leadership and role in forecasting, Reclamation has partnered with NOAA on this competition. To be eligible for prizes, solvers with skillful performance during the competition will be required to submit documentation of their forecast technique. This Challenge will be active for approximately 17 months, starting with a 3-month development period followed by a 1-month “pre-season,” and a 12-month competition period. 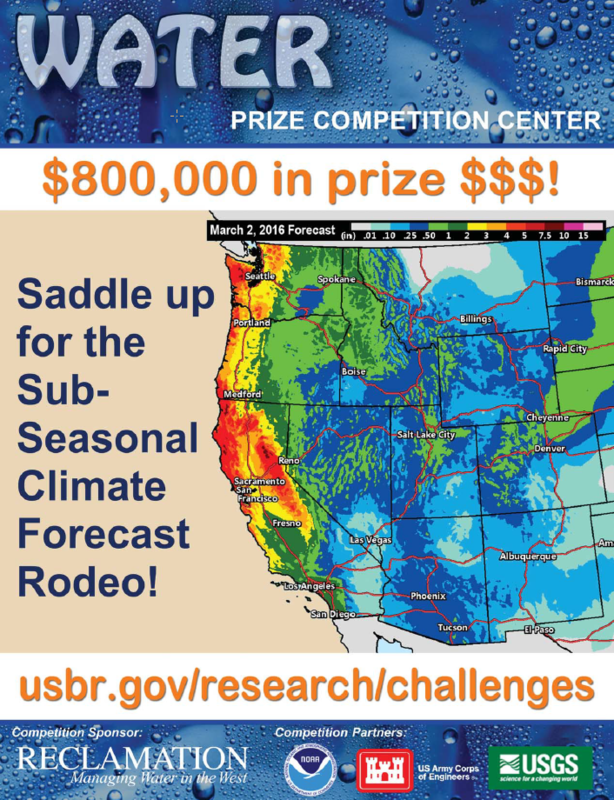 UPDATE - January 5, 2018 - The Forecast Rodeo Prize Competition is approximately halfway through and is showing strong results for forecasts of both temperature and precipitation! A number of teams are out-performing the benchmarks and some have opened notable leads. However, precipitation over next few months is critical to water availability for the upcoming year, so there is great interest in the remaining forecast results. See the latest scores and rankings at NIDIS and check back often. Winners are anticipated to be announced in September of 2018. UPDATE - May 17, 2017 - The Forecast Rodeo Prize Competition is in full swing and after a month of action, the first scores toward up to $800,000 in cash prizes will be released this week. This year-long, real-time forecasting competition, focused on western U.S. temperature and precipitation for weeks 3&4 and weeks 5&6. Reclamation is sponsoring the competition in partnership with NOAA, USGS, and the US Army Corps of Engineers. Forecasts are issued every other week and evaluated as observed data become available. To be eligible for cash prizes, teams must outperform benchmark existing forecasts. Winners are anticipated to be announced in September of 2018. Check back for new scores and other updates over the next year!